Kohetsu is one of our in-house brands that we contract out to some of the finest knife makers in Japan—in this case, the extremely talented Tsukahara-san from Seki City. 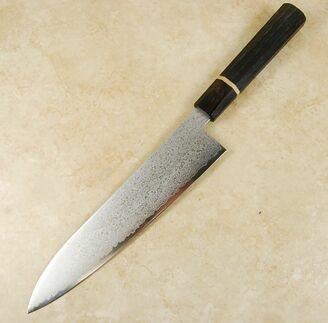 The core steel is VG-10, which is one of the most popular stainless steels used in the manufacturing of kitchen knives in Japan. This steel offers good corrosion and wear resistance, while still retaining the ability to produce a very sharp edge. 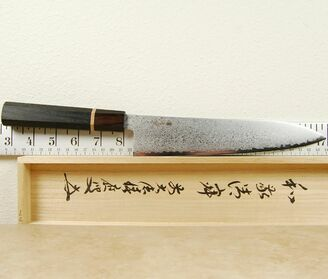 Tsukahara-san tempers the steel to a hardness of 60 HRC and then adds a cladding of stainless damascus using a san-mai construction. The lovely damascus pattern is obtained using an etched engraving technique. The fine looking kanji script is also etched for durability. This results in a great looking blade that is easy to maintain and care for. We really like 210mm gyutos for their compact dimensions and light and nimble feel. 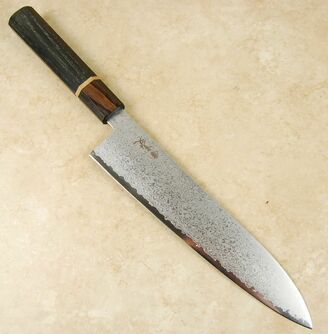 This knife adds to that formula with its easy to maintain attributes and wonderful looks. 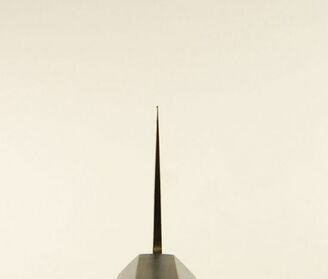 The icing on this particular knife cake is the fine octagonal handle made from 4,000 year old Bog Oak. This not only adds to the great looks but also to the fine over all feel of this well balanced and easy-to-use cutter.